These easy casserole recipes will spice up any meal! Mexican cuisine is quite popular with its neighbor to the north, the United States. Americans can't get enough of enchiladas, tacos, burritos, and tamales. This eCookbook, 20 Casserole Recipes for Mexican Food Lovers, is perfect for a Mexican food lover like you. It’s filled with your favorite Mexican fare—all in a casserole form. Don't Miss Our Other eCookbooks! Mexican food is a popular cuisine all over the United States, which is why I’m thrilled to present this Mexican eCookbook, 20 Casserole Recipes for Mexican Food Lovers. It’s filled with your favorite Mexican recipes - enchiladas, tacos, burritos, tamales—all in a casserole form. This makes them simpler to make without losing the flavors of the traditional versions. This eCookbook is broken down into five chapters: Recipes for Mexican Casseroles, Recipes for Enchiladas, Fun Recipes for Tacos, Recipes for Mexican Casseroles with Ground Beef, and Recipes for Mexican Casseroles with Chicken. Whatever kind of Mexican food you have a taste for, you’ll find it here. Love burritos? Then, you’ll love Burrito Pie (p. 16). Instead of rolling tortillas individually, you layer all of the ingredients in a casserole dish. In thirty minutes, your burrito meal will be table ready. Tamales make a great dinner, but is it feasible to make them on a weeknight after working all day? Now it is. Chicken Tamale Casserole (p. 22) has a cornbread crust and a filling that consists of such ingredients as chicken, corn, cheese, black beans, and tomatoes. The whole dinner is made in a skillet and is simple to make. Discover 18 more amazing Mexican food recipes in this eCookbook, 20 Casserole Recipes for Mexican Food Lovers. For more great casserole recipes, be sure to subscribe to our free newsletter, The Casserole Connection, to get free recipes delivered to your inbox every week. The first chapter of this eCookbook showcases general recipes for Mexican casseroles. These three recipes are very unique and will be well-received at your dinner table. Chips, Cheese, and Chili Casserole (p. 6, pictured) - is what you would get if you turned nachos into a casserole. The Mexican flavors come alive and will please your taste buds. Because this dish is easy to make and easily portable, it's great for a party, potluck, or game day. It's also vegetarian and gluten free, and can be made vegan if so desired. Chile Relleno Bake (p. 7, pictured) - This easy casserole is inspired by chile rellenos, or stuffed chilies. Instead of stuffing all of those chilies, just throw the ingredients in a casserole dish and bake. Well, there are a few more steps involved, but it's still easier than stuffing every chile individually. Plus, it tastes just as delicious. Aztec Pie - is the final recipe in this chapter. What does that involve, you ask? You'll have to download the eCookbook to find out! Download your free copy of the 20 Casserole Recipes for Mexican Food Lovers eCookbook today! Enchiladas are wonderful, but it takes time to roll up all of those tortillas. Wouldn't you much rather get the same taste with less work? Now you can. Chapter two of this eCookbook features recipes for enchiladas - in a casserole form. Turkey Enchilada Casserole (p. 9, pictured) - Though turkey isn't the most commonly used meat in Mexican food recipes, it certainly works. This is a great recipe is you have leftover turkey laying around, though you can use freshly cooked turkey, too. It's a cinch to throw together and is packed with flavor. Top it all off with a layer of cheese and enjoy your mouthwatering Mexican meal. Cheesy Enchilada Cupcakes (p. 10, pictured) The second recipe in this chapter is just as delicious as it is cute. 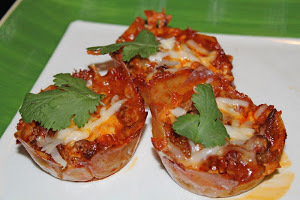 These "cupcakes" are made by lining wonton wrappers in muffin tins and filling them with typical enchilada ingredients. The wonton wrappers will become crispy and the cheese will melt to perfection. These bite-sized enchiladas are a must-try. Tacos are perhaps the most common and most loved type of Mexican food. Whether you prefer soft shell or hard shell, tacos can be modified to fit any person's tastes. Baked Crunchy Taco Casserole (p. 13, pictured). Line up your taco shells in a casserole dish and load them up with some meat and cheese. After they're done baking, top them off with lettuce, tomatoes, and sour cream, or your favorite taco toppings. Taco Quiche (p. 14, pictured). Jalapeno peppers and Pepper Jack cheese are on the ingredients list, but they become milder in the baking process, so if you're not a fan of hot and spicy food, there's no need to worry. Use a store-bought pie crust to speed up the process and then enjoy a wonderful, semi-homemade dinner. Chapter Four: Recipes for Mexican Casserole with Ground Beef includes six superb recipes. Cheesy Doritos Enchilada Casserole (p. 15) - This really is the ultimate meal. Tortillas are placed on the bottom and sides of a deep casserole dish, and a flavorful, ground beef/enchilada sauce mixture fills the center. The tortillas become crispy in the oven and the filling gets hot and bubbly. Make sure to wait until it cools before you dig in! Mexican Biscuit Casserole (p. 20, pictured). Canned biscuits are placed on top of a ground beef, chili beans, and corn mixture, which is then baked in a skillet until golden-brown. It's absolutely delightful. 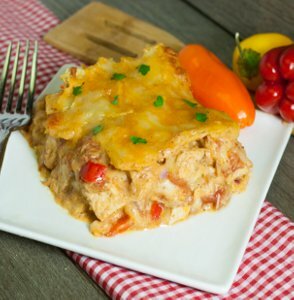 John Wayne Casserole (p. 18, pictured) - It's made with ground beef, beans, cream of chicken soup, salsa, and cheese. Perfect for a family dinner, potluck, or game day; this dish is sure to please everyone, including the Duke himself. So, like what you've read so far? The final chapter of this eCookbook focuses on Recipes for Mexican Casseroles with Chicken. These five recipes are last but certainly not least; this eCookbook ends with a bang. Tortilla Chip Casserole (p. 21, pictured) - With chicken, black beans, enchilada sauce, and Monterey Jack cheese, this easy-to-make casserole is a joy for the eyes as well as the stomach. It's easily freezable, too, so if you make two, you can freeze one for a lazy day. Dorito Chicken Casserole (p. 23, pictured) - This great dish has layers of chicken, Doritos, cream of chicken soup, and cheese. It's easy to throw together and will be done baking in 30 minutes. It's the perfect dinner for a family of four. AllFreeCasseroleRecipes eCookbooks are free downloadable recipe collections organized around a theme, such as easy casserole recipes, vegetable side dishes, and many more. These eCookbooks are PDF documents that can be downloaded off of our website, saved to your computer, and/or printed out for easy reference while cooking. If you are having trouble downloading our free eCookbooks, visit our FAQ Page: How to Download our eCookbooks. Weekly emails with casserole recipes, tips, collection pages and more. This sneak peek of what this new eCookbook has in store for you has hopefully convinced you to download it for free today. If any or all of these recipes appeal to you, click on one of the eCookbook icons anywhere on this page to download your free copy of 20 Casserole Recipes for Mexican Food Lovers. You've got nothing to lose! Once you get your copy, you can either keep it on your computer or eReader or print it out and keep it in your kitchen. No matter how you use your eCookbook, once you've tried even one of the recipes, you'll be glad you downloaded it. A great ebook for lovers of TexMex! And it's FREE! The best things about all these recipes - besides the great flavors, that is - is that they use ingredients that many of us have right there in our homes anyway. So download this free ebook and surprise your family with fabulously tasty meals! Oh, I am. And I want to make all of these. Yum! Nice recipes but that color scheme is a big mistake. There's not enough contrast between the neon-orange background and the plain-Jane black font. My 50 year-old eyes can't read the material. Do you have a plain black and white version? Or at least one with the text boxes in plain black and white? Then I could read it better...thanks. Hi mlktrout 0952341, Unfortunately we do not have a plain version. I would suggest trying to print the eBook in either black and white or grayscale. I hope that helps! Thank you for the free E-Book, but! These are not authentic Mexican recipes, but an Americanized version of Mexican recipes, please, what I would like to see is an E-Book of real Mexican dishes the way they are made in Mexico, not in the American Southwest. Now that would be an E-Book to enjoy. Receipts looks ok but please call them as they are tex-mex food, I'm mexican and this has nothing of mexican food, not because it has tortillas or beans you can call it mexican. Thank you for including the recipe source.